Journalist and business manager of the New Age, member of the CPSA Central Committee, political prisoner and defendant in the 1956 Treason Trial. Fred Carneson was born on 13th January 1920 in Goodwood, Cape Town to Anthony and Annie Carneson, a poor Catholic working class family, the sixth of nine children. Fred’s parents were both almost illiterate though his father learned to read just enough to enjoy simple books. His father worked as a coach painter for the railways in Salt River, Cape Town until he was transferred to Pietermaritzburg, Natal (now KwaZulu-Natal) railway workshops, in 1924, when Fred was four years old.Carneson, brought up as a devout Catholic, served as an altar boy in Pietermaritzburg. He was bright at school and won a bursary to Maritzburg College where he gained a first class Junior Certificate (Grade eight). He was the first in the family to be educated beyond Grade Eight. Unfortunately, his father could not afford to keep him at school and he was forced to leave school and begin working at the age of 14. He first worked as a messenger for the Post Office. He trained as a post and telegraph assistant, and worked at Post Offices in Durban, Pietermaritzburg and Port Shepstone. During this period he shared lodgings with students who were Communists and he decided to join the Communist Party of South Africa (CPSA) in 1936 at the age of 16.Carneson met his future wife, Sarah Rubin in 1936 in Pietermaritzburg. In 1938, Sarah helped him to establish the first Communist Party group in Pietermaritzburg. Soon after, he enlisted in the army to fight in the Second World War. From 1938 to 1945, he served as radio officer and saw duty in East Africa and Abyssinia (Ethiopia). While he was on leave, he travelled back to South Africa and married Sarah on 31 March 1943. He was badly injured at the Battle of El Alamein. It was during the war that Carneson met Brian Bunting on a boat going to the Suez. 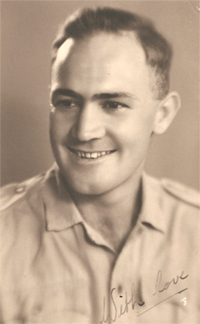 Bunting was to become his best friend and comrade over the years.After the war, Carneson worked for the Springbok Legion. The Carnesons moved to Cape Town where he became the full time secretary of the Western Cape CPSA in 1945. By 1946, Carneson was a member of the Central Committee of the CPSA. He was first arrested in August 1946 on charges of sedition when the United Party accused him and other communists for wanting to overthrow the government as part of their anti-communist campaign. Altogether, he was arrested over sixty times for political activities. An overwhelming majority elected Carneson as Representative for Native Affairs for the Cape City Council in 1949 until 1952 when Black people were disenfranchised. At the end of 1945, Carneson started work as manager, fund-raiser and editor of the Guardian, and then editor of New Age for ten years until 1963 when he was banned for the last time – eighteen years in all. Once a week, the Carnesons stood on street corners selling the Guardian.In 1952, both the Carnesons were banned for the first time. The banning order, on the couple, was repeated in 1954. This effectively prohibited them from working for Trade Unions and other related organisations. Later in 1954 he was prohibited from being in a gathering of more than two people and prohibited from printing, publishing or teaching. On 5 December 1956, Carneson was among the 156 arrested for treason. He was acquitted in 1961. Following the Sharpeville killings, Carneson went into hiding. Sarah Carneson was arrested on 8 April 1960, following the Government’s declaration of a state of emergency. She was released from prison on 31 August 1960 and a month later Carneson returned home from hiding. Carneson was asked to join Umkhonto we Sizwe (MK) as a “political commissar” for the Western Cape at the formation of the organisation. At this time, he was still editing New Age. Following the Rivonia Trial in 1964, the Government banned the New Age and served banning notices on Carneson and the others who worked on the paper. Sarah Carneson was also banned. They were frequently arrested for breaking their banning orders and their house was under a 24 hour police surveillance. On one occasion, snipers fired into their home just missing the Carneson’s young son, John’s head by a few inches. On 8 December 1965, the Security Police arrested Carneson again. He was tortured, kept in solitary confinement for 13 months and then imprisoned at Pretoria Central Prison.The Carneson family was forced to go into exile to London. When Sarah applied for permission to visit Fred she was told that she would be arrested if she re-entered South Africa.After nearly seven years in prison, Carneson was released on 24 February 1972. He left South Africa to join his family in London. Eventually, he was employed at the National Union of Teachers in London.He once again became active in the South African Communist Party (SACP). He became the international representative of the SACP, helping to raise funds for the SACP and the African National Congress (ANC). He also represented the SACP at numerous overseas conferences. Later, he was elected to the Chair of the Anti-Apartheid Trade Union Committee. However, both Fred and Sarah Carneson were not safe even in London. Their names appeared on a list called ‘Enemies of the Apartheid State’ and were targets for assassination. After the unbanning of political organisations, the Carnesons returned to Cape Town, South Africa on 19 May 1991, where they were greeted by a large reception of friends and well-wishers at the airport. They re-settled in Plumstead. From 1991, Carnseon served as the Western Cape treasurer for the SACP and was on the Executive Committee of the Provincial SACP. Both the Carnesons were active members of the ANC Wynberg branch.Carneson was nominated as the ANC staff representative on the transitional Cape Metropolitan Council and the Cape Regional Council. He was also elected onto the Reconstruction and Development Programme committee.Fred and Sarah campaigned tirelessly for the ANC prior to South Africa’s first democratic elections in April 1994.His daughter,Lynn Carneson-McGregor,published a memoir in 2010,Red in the Rainbow:Life and Times of Fred and Sarah Carneson. Fred Carneson passed away on 8th of September 2000 in Cape Town. • Carneson, L. Red in the Rainbow. Zebra Press, Cape Town (2010).